Product prices and availability are accurate as of 2019-04-09 16:11:45 EDT and are subject to change. Any price and availability information displayed on http://www.amazon.com/ at the time of purchase will apply to the purchase of this product. LARGE PACKET 68 days. 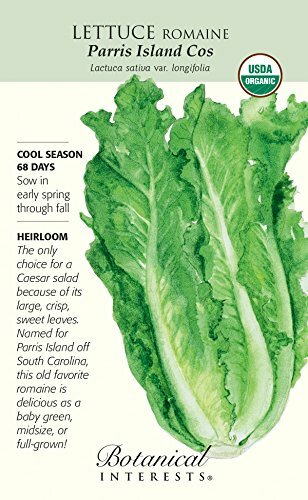 Crunchy, sweet leaves, buttery-green heart and vigorous growth are a few qualities of Parris Island Cos romaine lettuce. The slightly ruffled or savoyed leaves are appealing while the crisp texture is great for salads and sandwiches. Leaves of this versatile variety can be harvested at any size. Developed by Clemson University and the USDA, this 10 -12" tall, upright lettuce will be a favorite in your garden and your kitchen. Ideal for lettuce wraps. Plants resist tipburn and are mosaic virus tolerant. This packet sows forty 10-foot rows.